I'm still feeling soothed and enchanted by the Chanel Spring 2010 details video, below. The wheat-embroidered fabric is a standout (for Lagerfeld as well? Was this the underlying inspiration for the show's barnyard theme?). Whatever. Here's Chanel's version (click to see detail). And here is a vintage original--which I reckon to be '60s era, by the master beaders in Hong Kong--that is much of like, at least in its whole-grain goodness. Update it with a pair of skinnies for spring, and know that you are wearing the very chicest of forage. Love that sweater!! 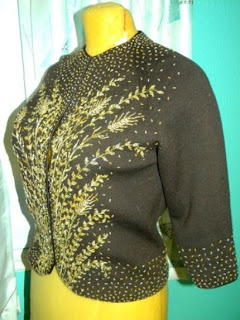 I've also been trying to find the perfect wheat brooch for fall but haven't come across the right one yet.